The Deer Hunter is a 1978 American war drama movie. It is set from 1967-1975 and is about three friends from Pennsylvania affected by the Vietnam War. The movie won five Academy Awards, including Best Picture and Best Director. It was named by the American Film Institute as the 53rd Greatest Movie of All Time. It was nominated for the BAFTA Award for Best Screenplay. In 1996, The Deer Hunter was picked to keep in the United States National Film Registry by the Library of Congress. Robert De Niro as S/Sgt. Michael "Mike" Vronsky. Producer Deeley wanted De Niro for The Deer Hunter because he felt that he needed De Niro's star power to sell a movie with a "gruesome-sounding storyline and a barely known director". De Niro prepared by talking with steelworkers in local bars and by visiting their homes. Cimino would introduce De Niro as his agent, Harry Ufland. No one recognized him. De Niro said this was his most physically exhausting movie. He said that the scene where Michael visits Steve in the hospital for the first time was the most emotional scene that he was ever involved with. Christopher Walken as Cpl. Nikanor "Nick" Chevotarevich. His won his first Academy Award, for Best Supporting Actor. John Savage as Cpl. Steven Pushkov. Savage was a last-minute replacement for Roy Scheider, who dropped out of the production two weeks before the start due to "creative differences". Universal kept Scheider to his three-picture contract for them by making him do Jaws 2. Meryl Streep as Linda. Before Deer Hunter, Streep had a small part in Fred Zinnemann's Julia and the eight-hour miniseries Holocaust. In the screenplay, Streep's role was very small. Cimino suggested that Streep write her own lines. John Cazale as Stanley ("Stosh"). All scenes with Cazale, who had terminal cancer, had to be done first. Because of his illness, the studio wanted to get rid of him. Streep, whom he was dating at the time, and Cimino said they would walk away if the studio fired Cazale. He died just after the movie was finished. Chuck Aspegren as Peter "Axel" Axelrod. Aspegren was not an actor. He was the foreman at an East Chicago steel works visited early in pre-production by De Niro and Cimino. They were so impressed with him that they offered him the role. He was the second person to be cast in the movie, after De Niro. St. Theodosius Russian Orthodox Cathedral, in the Tremont neighborhood of Cleveland, Ohio. The name plaque is clearly visible in one scene. 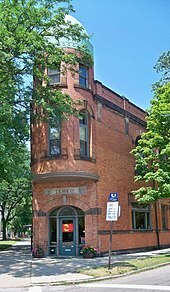 Lemko Hall, Cleveland, Ohio. Also in Tremont, the wedding banquet was shown here. The name is clearly visible in one scene. US Steel Central Furnaces in Cleveland, Ohio. Opening sequence steel mill scenes. Patpong, Bangkok, Thailand, the area used to show Saigon's red light district. North Cascades National Park, Washington, mountain scenes. Steubenville, Ohio, for some mill and neighborhood shots. Struthers, Ohio, for external house and long-range road shots. Weirton, West Virginia, for mill and trailer shots. River Kwai, Thailand, Prison camp and first Russian roulette scene. Deer Hunter was shown at one theater each in New York and Los Angeles for a week on December 8, 1978. The release was to qualify the movie for the Oscars. And one week would build interest. After the Oscar nominations, Universal widened the distribution to include major cities. A full-scale release was on February 23, 1979, just following the Oscars. The movie's first reviews were largely enthusiastic. Many critics said it was the best American epic since Francis Ford Coppola's The Godfather. Some people though did not like how the movie used Russian roulette. Many people did not like Cimino's next movie, Heaven's Gate. Because they thought it was so bad, they also changed their thoughts on The Deer Hunter. Instead of liking the movie people said they did not like it anymore. ↑ "The Deer Hunter (1978) - Awards". IMDb. Retrieved 2010-05-27. ↑ "Films Selected to The National Film Registry 1989–2008". Library of Congress. Retrieved 2010-06-11. ↑ De Niro, Robert (actor) (June 12, 2003). AFI Life Achievement Award: A Tribute to Robert De Niro. [Television Production] American Film Institute. ↑ "Richard Shepard Talks John Cazale Doc, Plus The Trailer For 'I Knew It Was You'". The Playlist. June 1, 2010. Retrieved 2010-09-24. ↑ 12.0 12.1 "The Deer Hunter (1978)" – via www.imdb.com. ↑ "LEMKO HALL". Encyclopedia of Cleveland History - Case Western Reserve University. 11 May 2018. ↑ "Filming of The Deer Hunter". www.wvculture.org. ↑ Biskind, Peter (March 2008). "The Vietnam Oscars". Vanity Fair. Retrieved 2010-09-17. ↑ 18.0 18.1 "The Deer Hunter (1978) - Release dates". IMDb. Retrieved 2010-07-25. ↑ Ebert, Roger & Siskel, Gene (hosts); Flaum, Thea & Solley, Ray (producers); Denny, Patterson (director). (1979). Sneak Previews: Oscar Preview for 1978. [Television Production]. Chicago, IL: WTTW. ↑ Canby, Vincent (December 15, 1978). "Movie Review: The Deer Hunter (1978)". The New York Times. Retrieved 2010-09-20. ↑ The 2006 DVD release of The Deer Hunter clocks in at 3 hours, 3 minutes and 22 seconds.